It often strikes me as odd that we describe ourselves as 'food growers' whereas, in fact, the real growers are the plants themselves; they do not just grow themselves they grow the rest of us - they are in ecological speak the 'primary producers'. Every time I recall that I find myself quietly amazed - they make all the food. Yes all of it not just your veg...And all from a few minerals, the air, the sun and water...it's extraordinary. So what is the garden doing now - well as you will know it's on the cusp of its spring revival and everything is awakening from its winter rest - and as gardeners we capitalise on this by sowing seeds and planting tubers - mostly potatoes; but soon it will be time for more exotic tubers such as Yacon Oc a or Mashua - we have grown both Oca and Mashua at the college before, but it is our first time with Yacon. (Yacon has a lovely botanical name Smallanthus sonchifolius that sounds like it's been made up by a desperate student in a plant identification test). It's a rather beautiful perennial plant from the Central and Northern Andes with sweet tasting roots. It is not fully hardy and so can only really survive in gardens that do not get hard frosts. Late spring it the best time to plant out tubers - the plants are vigorous reaching 2m in height - they are strong growers like the sunflowers and Jerusalem artichokes to which they are related. 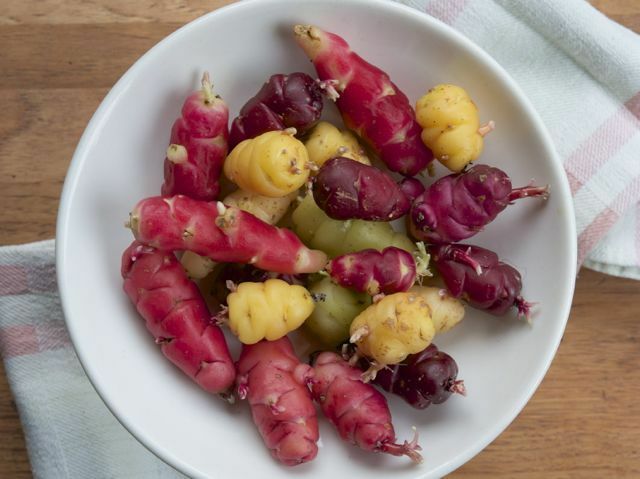 They need a long season so you will not be harvesting tubers until Autumn. The flowers are pretty but small in comparison - to be savoured at close quarters. The tubers can be eaten raw or cooked and like Jerusalem artichokes are high in inulin a carbohydrate we cannot digest - So be aware if you are sensitive to Jerusalem artichokes. Otherwise enjoy eating a food that requires very little attention from 'the grower'. Find out more about what's happening in our garden here and learn how to become one of our 2016 Horticulture Apprentices studying under Jane.